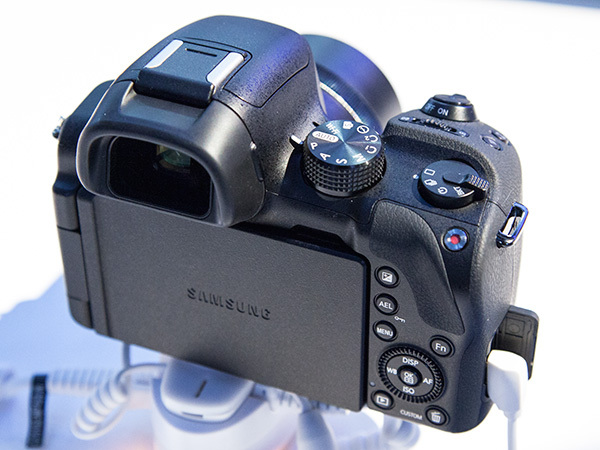 At CES 2014 this week, Samsung revealed more of its latest NX30 digital camera's features and we were there to check them out. If you're not familiar with Samsung's range of interchangeable lens camera line-up, the new NX30 is the latest iteration of their NX series of smart cameras, replacing the NX20 with a set of better features and improved image quality. First off, the new NX30's body is slightly improved, with a more curvy design that gives your hand a more comfortable and firmer grip. 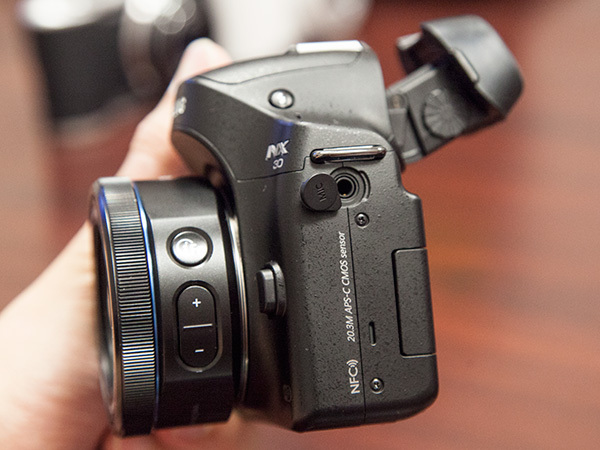 Holding the camera in one hand does make you feel more at ease with the handle that seems to conform very nicely to how you would typically hold and operate the camera in one hand. Most of the controls and buttons are similarly located, so there's not much to re-learn if you're upgrading from the NX20. On the rear end of the camera, you'll find the familiar controls to the camera including the 3-inch Super AMOLED touch screen swivel panel. The screen has been upgraded from the pentile AMOLED display in the NX20 to a more refined S-Stripe AMOLED display. This gives the screen better resolution as well as higher brightness, from 300nits on the NX20 to a maximum of 400nits on the new NX30. 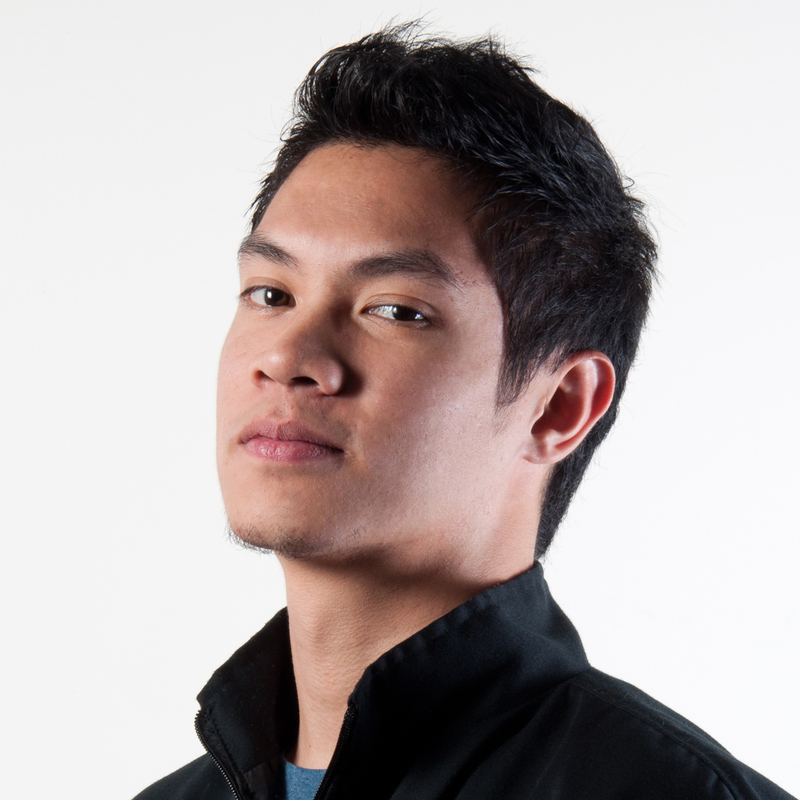 This will give users a better view of their subjects even when operating outdoors. The improved display now sports a higher pixel density at 287ppi and it displays at a resolution of 720x480. Besides giving users a brighter and more detailed display, Samsung's new AMOLED screen also promises to perform better as well, with a wider color gamut that covers almost 100% of the Adobe RGB color space. This would undoubtedly give users a more accurate preview of their shots, resulting in less variance between what they see on the camera and what they'll get on their printouts or on professional computer screens. 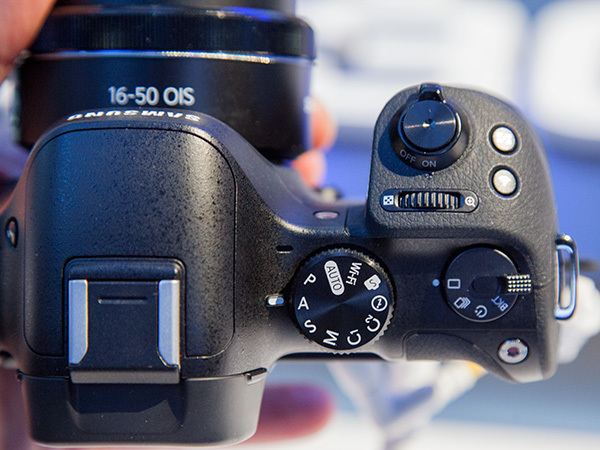 Also new on the Samsung NX30 is an improved electronic viewfinder (EVF) which is tiltable up to 80 degrees. This added feature gives users another degree of freedom in capturing shots from peculiar angles. 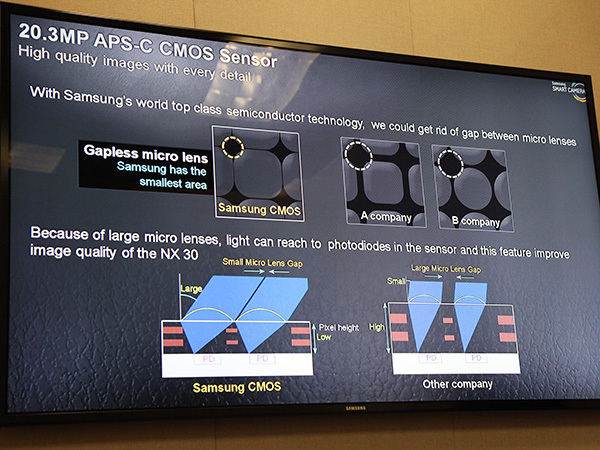 Samsung has also vastly improved the EVF with an XGA display with an equivalent of 2359K dots using an LCOS screen. 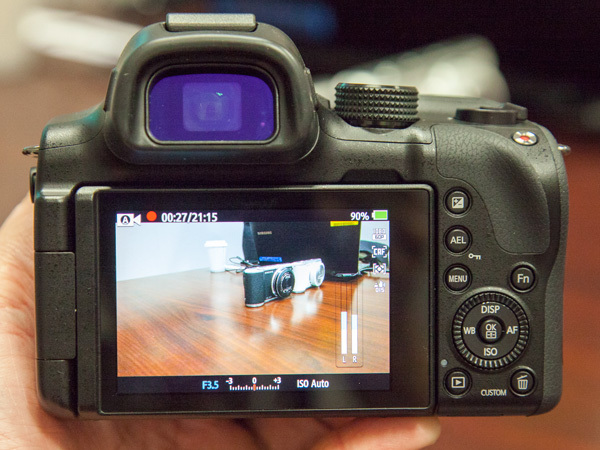 For enthusiasts who shoot videos with the NX30, the camera now supports live HDMI streaming at uncompressed 4:2:0 format to third party HDMI accessories such as external EVFs or external recorders. However, HDMI live streaming is only available using the FHD/30p mode. Further enhancing the video recording feature, Samsung has now included a 3.5mm microphone input that lets you use external and third party microphones. When shooting videos, an audio level meter is now displayed on the screen to visually let you monitor the sound. The camera also automatically adjusts the audio gain as well as giving you control to adjust the input level manually, with up to 12 different levels. The layout of the buttons on top have also been slightly redesigned to better give users quicker access to various controls. On the mode dial itself, you'll now find two selectable custom modes, giving you faster access to your favorite shooting mode. Although only two are accessible from the mode dial, the camera has an additional 8 stored modes within the camera settings. Beside the mode dial, you'll now find a new drive dial which lets you quickly set one of four selectable drive modes - single, continuous, timer and bracket. 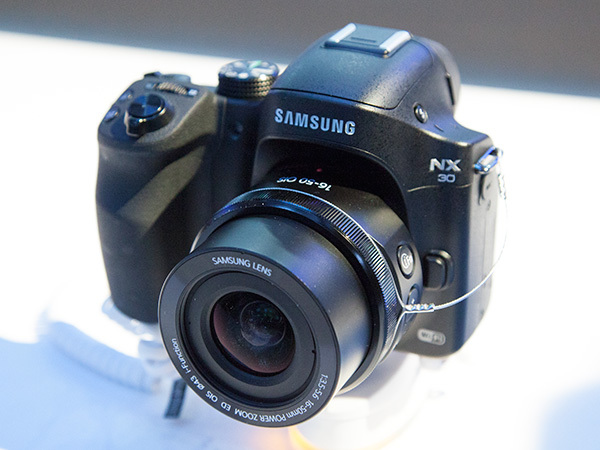 Apart from improvements to the design of the camera, Samsung has also improved its CMOS sensor used within the NX30. Manufacturing their own sensors, Samsung claims that they have improved the design and process to better enhance the sensor's sensitivity and performance. 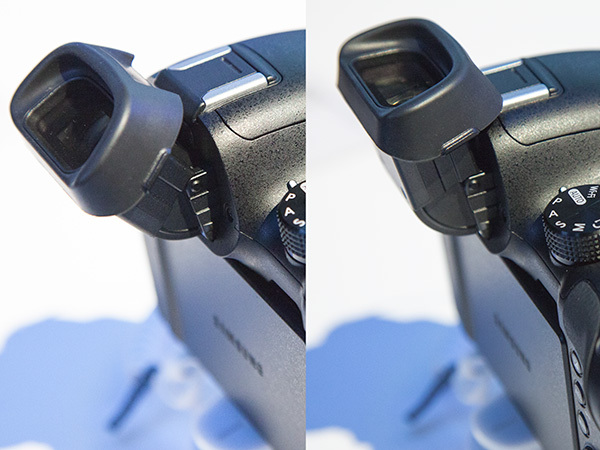 One of the tweaks they've done was to reduce the gap between each micro lens, the tiny area between the photodiodes. Samsung explained that if they can reduce the gap between the photodiodes, then they could give the lens more space to capture light. This would directly improve the performance of the sensor, giving it much better performance. They've also significantly reduced the height between the micro lens and the photodiode, thus reducing the loss of light captured while travelling through the sensor structure. 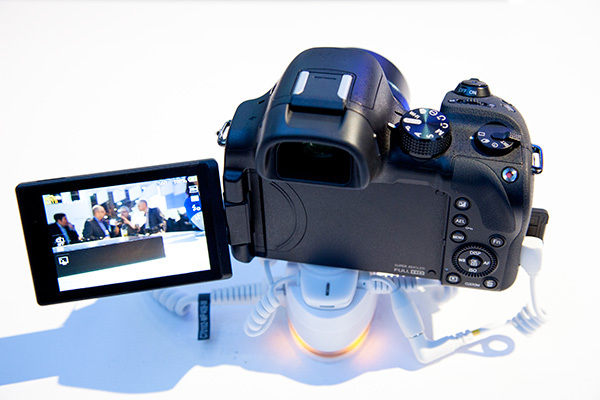 All in all, we can see that Samsung has added a whole host of useful features to the NX30. While initial impressions on the prototype unit were good, we will reserve our final judgement only after we've thoroughly review and test the camera. So stay tune and look out for our review of Samsung's final shipping unit when it's made available to us.